Enter your email address for a free download of "My Little Girl in Tennessee"
BLUE SERIES 7" SINGLE: "MAN IN THE MIDDLE"/"BLUE NIGHT"
The 7" vinyl single, produced by Jack White, is now available in many indie retail stores, and can be purchased online here. 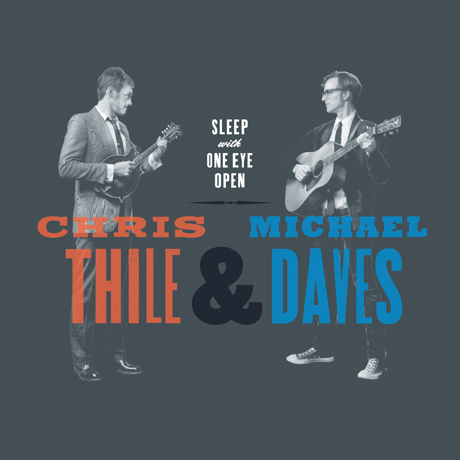 Sleep with One Eye Open is an impassioned collaboration/conversation between mandolin virtuoso Chris Thile and guitarist Michael Daves in which the subject is bluegrass, specifically how this upstart duo can acknowledge history and tradition while exuberantly defying convention. Though it was recorded in four feverish days of sessions at Jack White’s Third Man Studio in Nashville, the album has deep roots in a serendipitous side of New York City that reveals itself at certain times of the night, when strangers become kindred spirits as clubs empty out, and only the hardiest souls stick around to keep the music playing. It’s a story that begins, like so many, with a guy walking into a bar. "They’ve been playing small club shows downtown, and they brought that informality to the Allen Room," writes New York Times music critic Jon Pareles in his concert review, "punctuating dazzling virtuosity with bluegrass-aficionado banter and 'Fiddle Tune Request Time. '” Read the full concert review here. In the June edition of Rolling Stone, Will Hermes writes of Sleep With One Eye Open: "This ridiculously blazing set...focuses instead on old timey material by Bill Monroe, Lester Flatt, and others. Dusty museum pieces they’re not: The uptempo jams are wild-picking shred fests, and the ballads cut deep." You can read the full review online here. In the latest review of Sleep With One Eye Open, Matthew Milton says of Chris and Michael: "They turn standard bluegrass hot licks into molten lava without breaking a sweat." Read the full review in the July edition of Songlines Magazine. Jim Gilchrist, in his review of Sleep With One Eye Open for the Scotsman, writes: "And this is unadulterated bluegrass all right, with tracks such as Bill Monroe's Tennessee Blues taking no prisoners and the duo's uninhibited "high and lonesome" hollering defining such numbers as 20/20 Vision and the title song." Read the full review here. In the second part of Mandolin Cafe's feature and interview, Bradley Klein details Chris and Michael's instruments, the recording process, and Chris and Michael discuss the album track-by-track. Read the full feature here. Nate Dow of the Boston Herald describes Sleep With One Eye Open: "It is pure virtuosity — back-porch raw and without the usual studio sandpapering that often erodes the edges." Read the full review here. "The entire collection is enjoyable, but the spirited instrumental, "Billy in the Lowground", the jubilant "My Little Girl in Tennessee" and a stirring rendition of the classic "Roll in My Sweet Baby's Arms" are particularly memorable.Both "Rain and Snow" and the gorgeously dreary "Bury Me Beneath the Willow" showcase the duo's vocal compatibility." Read Greg Yost's full review here. "Thile and Daves, a Georgia-born guitarist, met in New York but this is the music of their roots, the lonesome country blues of "brother groups" such as the Monroes and the Louvins, sung with yelpin' Southern boy passion and dovetailing harmonies and picked frenetically, at times frantically, and adventurously yet always with awareness of the traditional form. Bill Monroe's Mississippi Waltz and Frank Rodgers' Ookpik Waltz offer more reflection, indeed tenderness, but whether they're working their fingers to the bone or singing their hearts out, this is music of wonderful vitality." Read Rob Adam's full review from the Sunday Herald here. Rolling Stone offers a first-listen of "Man in the Middle," the A-side of the upcoming 7" vinyl, produced by Jack White. Stream the track here. Martin Townsend of the Sunday Express gives Sleep With One Eye Open a perfect five-star grade: "This new CD takes Thile firmly back to his roots as he and guitarist Michael Daves play lightning-fast interpretations of traditional bluegrass. The blend of instruments and voices is sublime, particularly on the Everlys-ish You’re Running Wild, but that wonderful, hypnotic oddness still lurks. " Read the full review here. 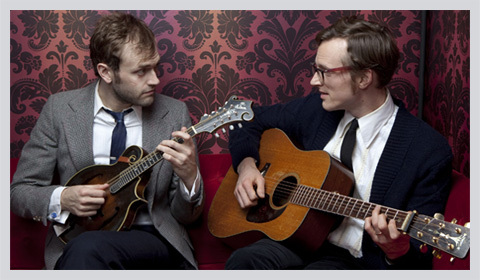 "Mandolin player and singer Chris Thile is best-known for leading engaging bluegrass fiddle band the Punch Brothers. Here he foregoes artiness and goes back to bluegrass roots with guitarist and singer Michael Daves. The two make a fine vocal duo, but even more astonishing is their instrumental virtuosity. " Read Ivan Hewett's four-star review here. Sleep With One Eye Open was recently featured on the "Hit List: Metro Life's Pick of Sound, Screen and Print", in which they wrote: "Mandolin maestro Thile and guitar sidekick Daves bring an up-all-night intensity and blinding technical virtuosity on a series of old-time bluegrass tracks." "This sums up Sleep, quite well, really. It does its best to be both old and new. We get the old alongside a succinct lesson in traditional music and in Daves high tenor. The new sneaks its way through in the progressive take on the instrumentation that Thile and Daves so deftly employ." Read the full review here. Brooklyn Vegan previews Chris and Michael's last night of three at the Rockwood Music Hall, to celebrate the release of Sleep With One Eye Open, read the full preview here. Michael sits down with Uprooted Music to discuss his musical background and the story behind the new album: "When we were making the album we got a sense of what we were doing and what was coming together, and that kind of continued as we chose tracks and mastered the stuff. When you take 24 songs, or the 16 on the album, and just by choosing the order of the songs, you could make entirely different albums with the same 16 songs." Read the full interview here. In a 4.5 star review, Mick Taylor writes: "Energy is the name of the game, which means it was recorded live of course, despite the dizzying complexity of the playing. Fans of perfectly produced modern country might find it a bit hard work, but any bluegrass fan can't help but be captivated." Chris Mateer writes "Sleep With One Eye Open is a smartly-paced and well-varied set of tunes, performed with celebratory vigor and and passion for the material." As for the upcoming 7" vinyl single, he says "It's quite an intriguing listen, which acts like the album's dirty little troublemaking brother." Read the full review here. Michael: "When I met Chris, it was impossible for me to push aside this part of my musical background, improvisation, harmony. There is an undeniable conversation going on, on that level as well, and that's what's compelling about this project for me." Read the rest of Bradley Klein's interview with Chris and Michael here. "It is a pleasure to hear such virtuosic types giving themselves over to high-end ribaldry, in the shape of a headlong charge into the music first offered by the Monroe Bros, the Louvins and Flatt & Scruggs. 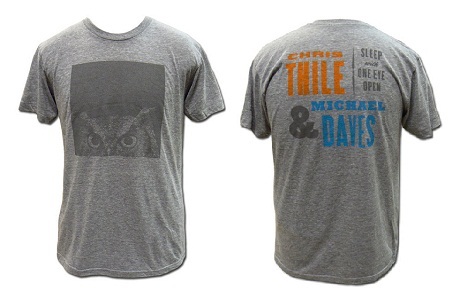 Daves is a guitarist, Thile a genius of the mandolin. Both sing. Together they hammer and tongs the songs like smiths." Read the full review, by Nick Coleman, here. 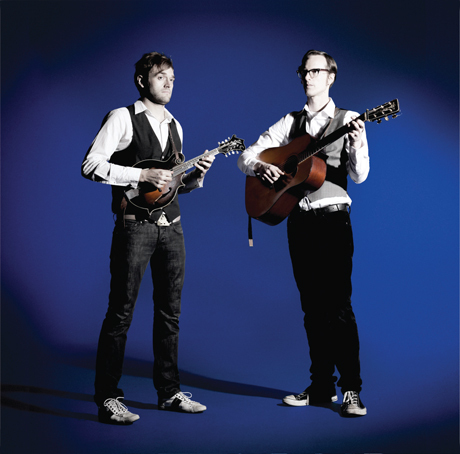 The New York Times previews Chris and Michael's three-night stint at Rockwood Music Hall to open up their tour: "Folk traditionalism also illuminates a rip-roaring partnership between the mandolin virtuoso CHRIS THILE and the flat-picking guitarist MICHAEL DAVES. This week, to usher in the release of “Sleep With One Eye Open,” their Nonesuch debut, they’ll spend three nights at the Rockwood Music Hall. Bluegrass, in their hands, gets roughed up in the best possible way, with skill and fervor, and a touch of abandon." Check out the rest of the preview here. "Thile and Daves rip through 16 traditional tracks from the likes of Bill Monroe and Lester Flatt. They slow down only for the straining harmonies of Ray Endenton and Don Winters’s You’re Running Wild and Frank Rodgers’s Ookpik Waltz, bringing an up-all-night intensity and a technical virtuosity to these tracks." Read Claire Allfree's four-star review here.